1 of 5 In a bowl, stir soy sauce, sesame oil, rice vinegar, brown sugar, ginger, red pepper flakes and oyster sauce. 2 of 5 Place steak in a large resealable plastic bag; add half of the marinade; reserve remaining half. Refrigerate for 2 hours. 3 of 5 Heat broiler. In a medium-size skillet, cook beans and 1/2 cup water, covered, over medium-high heat for 5 minutes. Remove cover, add peppers and cook for 5 minutes or until water cooks off. 4 of 5 Meanwhile, coat a broiler pan with nonstick spray. Remove steak from marinade (and discard marinade). Broil steak 4 minutes per side or until instant-read thermometer reads 155 degrees F. Place on a cutting board to rest. 5 of 5 Stir cornstarch mixture into reserved marinade; add to beans along with cashews and cook 2 to 3 minutes or until thickened. 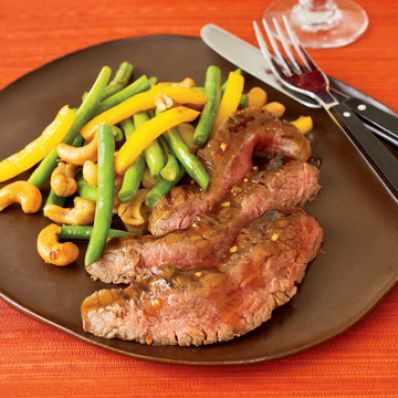 Slice steak and serve with beans. Per Serving: 38 g pro., 522 kcal cal., 931 mg sodium, 7 g fiber, 73 mg chol., 35 g carb.